On September 22, 1862, Abraham Lincoln convened his cabinet and announced his decision to issue the Preliminary Emancipation Proclamation that day. Each year, we recognize this anniversary in a variety of ways, from our tours, to articles, to special programs like the Freedom 5K and Family Day, providing distinctive ways for visitors near and far to engage on the idea of freedom. This year for Family Day, we had fun with the story of Lincoln storing his ideas in the lining of his hat. Our team created an oversized, walk-in top hat for people to write their own brave ideas that they hope to make a reality. See photos from that day here. It’s hard to believe that just over ten years ago we weren’t open to the public yet. Now we’re a trusted resource for people looking to both understand the disturbing truths about our past and pave the way for a better and brighter future for all. We couldn’t do this without your support. This year the Cottage is celebrating ten years of being open to the public. As part of #10YearsofPLC, we’re bringing you various top ten lists related to Lincoln and the Cottage. With the recent news that the Cottage is unveiling new spaces for site rentals, we’re focusing on the beautiful grounds of the Soldiers’ Home (today know as the Armed Forces Retirement Home). Here’s a list of the top ten things Lincoln and his family saw while living at the Soldiers’ Home. Read the list here. Help nominate President Lincoln’s Cottage as Best Museum (Non-Smithsonian) in the Washington Post Express’ “Best Of 2018” Competition. This year marks 10 years of President Lincoln’s Cottage being open to the public — celebrate with us! To celebrate 10 years, we’ll be offering tickets at select dates for only $10. On Sunday, September 30, we’re participating in the Armed Forces Retirement Home’s Fall Fest. Right here on the grounds, enjoy the festivities, then sign up for a reduced $10 admission all day ($5 for children and members). Back by popular demand, President Lincoln’s Cottage and the DC Improv bring you Two Faces Comedy, a series of comedy nights that transform Lincoln’s drawing room into a comedy den. The theme for the October night is mental health, based on Lincoln’s own dealings with depression. Each of the performers will incorporate that theme into their sets, however they choose. Don’t forget to save the date for our third and final night, November 14. Registration information TBD. Each show takes place inside the Cottage, starts at 7:30pm, and is $5 a ticket. On Saturday, September 22nd, President Lincoln’s Cottage welcomed over 1,000 people on its grounds for a day of racing and family fun: Homecoming. The day kicked off with our Freedom 5K race, where for the second year in a row the Bucktails, Lincoln’s guard, shot off muskets to signal the start of the race. Guests spent the rest of the day, the exact anniversary of the Preliminary Emancipation Proclamation, creating arts and crafts, performing in an interactive theatre (thanks to Shakespeare Folgers Library), placing brave ideas in a giant Lincoln hat, meeting the Bucktails, riding ponies, touring the Cottage and Sherman tower, picnicking on the grounds, and more! Congratulations to all of our runners of the Freedom 5K, and special congratulations to the top finishers: Caitlin Henry and Erik Lundgren. All proceeds from the Freedom 5K go towards educational programs at the Cottage. For more photos from the day, click here. Another new element to Homecoming this year was a 10-foot tall Lincoln hat. President Lincoln had a unique habit of storing his ideas inside his signature stovepipe hat. With the 10-foot tall Lincoln Hat, children and families were able to walk inside and hang up their brave ideas to make their communities stronger. See some of their brave ideas here. President Lincoln’s Cottage is excited to announce over 25,000 square feet of newly available spaces for special events. 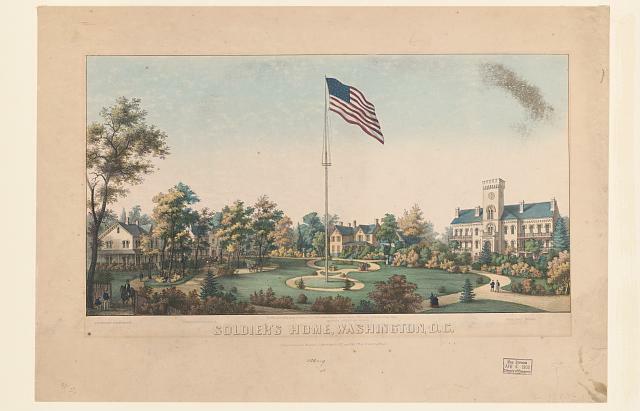 For the very first time in history, three 19th century structures of the Soldiers’ Home and their adjacent grounds will be accessible to the public — exclusively to event clients and guests of President Lincoln’s Cottage. Please contact events@lincolncottage.org to learn more about this exciting opportunity. For this month’s preservation update, Senior Preservationist Jeff Larry explains how we’re currently restoring a balcony on the Cottage’s western elevation. For photos showing how badly water infiltration has damaged this restored balcony, click here. New to the store, some added flair! Show your Lincoln pride by donning one of our two new temporary tattoos. You can choose from a sketch of Lincoln or our Home for Brave Ideas logo, $2 each, sold in the Museum Store located in the Robert H. Smith Visitor’s Education Center. Save the date! President Lincoln’s Cottage will once again be participating in the Museum Shop Holiday Market at Strathmore, November 8th-11th. Stay tuned to future newsletters and emails for more details. Homecoming and the Freedom 5K were listed on thirteen online events calendars or blogs. Mommy Dearest, the Brookland Bridge, The DC Line, Hoodline, and others all promoted the event, claiming it was a “top” thing to do in Washington, D.C. that weekend. A July wedding was featured on the wedding blog, A Bride’s BFF. Support our educational programs, preservation efforts and public events by making a contribution to President Lincoln’s Cottage. Donate online today.